Most photovoltaic solar panels are used to charge a battery during the daytime. Nearly all panels come equipped with a blocking diode. The diode prevents DC current from flowing backwards from the battery bank into the panel at night. 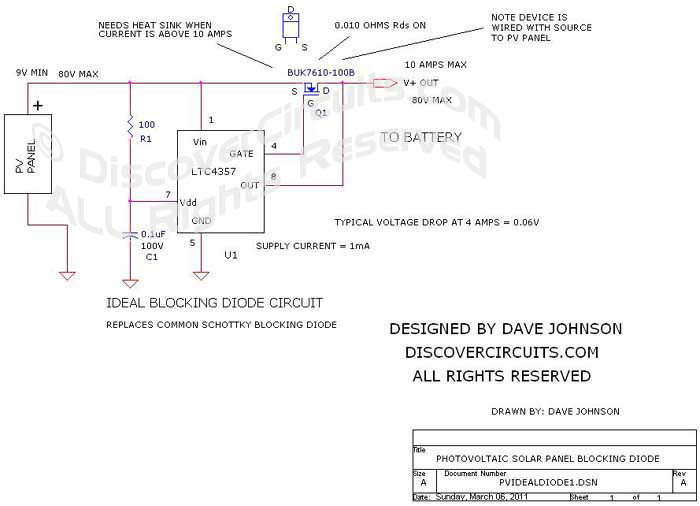 The usual blocking device of choice is a schottky diode with a typical 0.5v voltage drop. In some large panels, which can often source over 4 Amps of current, the power loses due to this voltage drop can add up. As an example a 4KW solar power system made of 20 200 watt panels will dissipate some 40 watts of power in the diodes. The circuit below uses a new high voltage ideal diode IC from Linear Technology. The LTC4357 contains all the circuitry needed to control an external n-channel FET. The circuit shown below performs a standard diode function with a much lower 0.06 voltage drop at 4 Amps. When current tries to flow in the other direction, the IC turns off the FET, blocking the current. The LTC4357 contains a charge pump circuit to provide the needed gate-source voltage for the n-channel device. An n-channel is used since they tend to have much lower channel resistances and higher voltages than p-channel parts. The 100v device picked has an on resistance of only 0.015 ohms. The circuit is good for over 10 Amps but I would recommend that the FET be mounted to a heat sink if the current exceeds 8 Amps.